Dr. Krohel is a board-certified ophthalmologist who specializes in the medical treatment of patients needing neuro-ophthalmological and oculoplastic care. Dr. Krohel completed medical school and residency at Albany Medical Center. He was Vice-Chairman of the department from 1982-1986, and was named Professor of Ophthalmology and Neurology in 1988. Dr. Krohel completed fellowship training in orbital disease and oculoplastic surgery at Moorefield’s Eye Hospital in London, England, and completed further fellowship training in neuro-ophthalmology at the Stein Eye Institute at UCLA in California. Dr. Krohel has served as a consultant reviewer for several ophthalmic journals including the Archives of Ophthalmology, Ophthalmology, and Survey of Ophthalmology. He was also an associate examiner for the American Board of Ophthalmology. Dr. Krohel has published or presented over 185 scientific papers and authored a book on Orbital Disease He has authored over 100 articles in neuro-ophthalmology and orbital disease. He has been a visiting professor on over 70 occasions, both nationally and internationally. 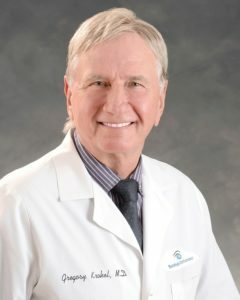 Dr. Krohel received research awards from the Sight Conservation Society of Northeastern New York, the National Institute of Health, the Veterans Administration, and was the recipient of the American Academy of Ophthalmology Medal of Honor Award for Distinguished Service in 1985. He received the Teacher of the Year award from the Albany Medical College Resident Program in 1997. Areas of special interest include screening and management of patients treated with Plaquenil (Hydroxychloroquine).